‘BOXBOROUGH-STOW EMERGENCY SERVICES APPRECIATION DAY’ is set for Saturday, December 14th from 11am to 2pm. During this period of thanksgiving, our pilot community and airport owners Nancy and Don McPherson have found a way to say “Thank you” to our local emergency personnel for all that they do for us. Festivities will include testimonials, presentation of citations from the statehouse (thank you Kate Hogan and Jen Benson), a light lunch, cake, ice cream and free airplane rides. It’s right around the corner, so you don’t miss out on this heartwarming event. KATE HOGAN’S ‘OLD FASHIONED COUNTRY PIE FUNDRAISER’ was a success. Kate is a strong supporter of our aviation community here in Stow, in the halls of the Statehouse, before committees and on the House of Representatives floor with her votes. It was great to see so many come by to thank her in person for her support of GA in Massachusetts and at Minute Man. Nancy’s will be closed for Christmas 12/23 – 12/26 and on Wednesday 1/1/14. FOMA’s ‘Hangar Talk’ is set for Saturday January 4th at 8:30 am at Nancy’s Café. Sign up on their web site, www.FOMA-6B6.com for FOMA news! All are welcome. EAA Chapter 196 (www.eaa196.org) held their annual Holiday Dinner Party at Nancy’s Café on December 6th. By all accounts, they had a great time and enjoyed Nancy’s delicious offerings. Their next meeting will coincide with our annual ‘Kick Off’ party on January 23rd. The next ‘IMC CLUB’ MEETING will be held in the Magenta Flight Training classroom on Tuesday, 12/17 at 7pm. Their monthly meetings help develop safety and proficiency in their members by using real world ‘Scenario Based Learning’. All are welcome, regardless of your rating. FOMA’s ‘LAMA’ Contest (‘Landed at All Massachusetts Airports’) has only a few weeks to go. All successful contestants will receive a $50 gift certificate for dinner at Nancy’s. Hurry!!! December’s Full Moon Fly Out Set for the 14th – 20th. We will return to the ‘121 Restaurant’ at the Waterbury-Oxford Airport in CT. The rumors I had heard about great food were all true and it couldn’t be more convenient. I-495, I-290, the Mass Pike and CT-84 are close by on your left on the way down and the view passing over Hartford is breathtaking. Park right in front and hop inside. You can pick up menus in the OPS Office to get a better feel for what’s in store for you. This is my new ‘Go TO’ fly-out restaurant – join us this month and make it yours too! TINKER, TAYLOR, BUILDER, PILOT is a new group forming up at Minute Man. They meet at Nancy’s at 11 for lunch on the third Saturday of each month. If you’re a builder or a tinkerer or just want to know how to change your own oil, stop by. Show off your work after lunch – all are welcome! *The ‘BEST FUEL PRICE’ may change during the month when a new fuel shipment starts flowing. Kate is a strong supporter of our aviation community, not only here in Stow, but statewide as well. She has frequently demonstrated her support at airport functions such as our ‘Wings and Wheels’ events last summer and her regular appearances at our January ‘Kick-Off Parties’. Perhaps most importantly, she has supported aviation legislation in the halls of the Statehouse, before committees and on the House of Representatives floor with her votes. Please take this opportunity to come by, meet her (if you haven’t already) and thank her in person for her support of General Aviation in Massachusetts and right here at Minute Man Air Field. NANCY’S PIZZA OVEN is now housed in its new tent just outside the Café kitchen door. Yummy pizza is now available on Fridays and Saturdays. ‘Like’ her on Facebook or visit her website for menus, hours, special events and more. Think of Nancy’s for your upcoming holiday parties. FOMA’s ‘Hangar Talk’ is set for Saturday 11/2 at 8:30 am at Nancy’s Café. Join aviation enthusiasts, future/current pilots and airport supporters on the 1st Saturday of every month, to learn about GA and share your flying experiences over a free cup of coffee. The conversation will be focused with the return of ‘The Challenge Question of the Day’! So, brush up on your knowledge of all things aviation and join the fun. Sign up on their website, for FOMA news! EAA Chapter 196 will host their last scheduled Young Eagles Flight Rally (FREE RIDES for children) from 9am ‘til noon on Saturday, November 9th. Their normal ‘last Monday of the month’ meeting will move to coincide with their annual Holiday Dinner Party on Friday, December 6th at Nancy’s Café. Contact Chapter President Hector Constantzos if you would like to join them for this festive occasion. ‘REAL WORLD DESIGN CHALLENGE’ OPEN HOUSE for Nashoba Regional High School students will be held Saturday, 11/9, at 10am in the OPS Office. School administration and local pilot-mentors are teaming up to bring this nationally organized program to Nashoba students. Learn more about the RWDC at their website. Direct any questions to Don McPherson. The ‘IMC CLUB’ KICKOFF MEETING was so well attended it had to be moved from the Magenta Flight Training classroom to the South Hangar East! The Stow Chapter of the nationally operating IMC Club will be providing organized “hangar flying” focused on building proficiency in instrument flying. Monthly meetings will develop safety and proficiency in its members by using real world ‘Scenario Based Learning’ to engage members and allow them to share and build their experience. The November meeting will be on the 19th at 7pm in the Magenta Flight Training classroom. THE FOMA ‘LAMA’ Contest’s (‘Landed at All Massachusetts Airports’) first ‘Contender’ has turned in his ‘Log Sheet’. He had a rewarding time and will share some of his most memorable ones with us at our annual ‘Kick-Off Party’ in January. Pick up rules and entry forms in OPS and at Magenta – don’t be left out. All successful contestants will receive a $50 gift certificate for dinner at Nancy’s. Explore all Massachusetts’ airports and fill your ‘flying stories’ book with new adventures! Take a friend along and have some fun! Social Flight, the brainchild of our 6B6 based Bonanza owner, Jeff Simon, is our newest event posting site as we venture further into ‘social media’. I urge you to visit the site and sign up for the 7-Day Event Planner via email. It’s easy to use (I did it w/o coaching!) and it’s FREE! November’s Full Moon Fly Out Set for the 14th – 20th. Pick the WX that meets your personal flight requirements and then schedule a flight to introduce some folks to GA. Consider inviting a fireman, policeman, selectman, reporter, state rep, or senator to go with you. Spread the word about the benefits of GA while having a good time. Call OPS to give or get destination information. MASSACHUSETTS AIRPORT MANAGEMENT ASSOCIATION (MAMA) celebrated their 40th anniversary last month and conducted their annual conference at Gillette Stadium in late September. Minute Man’s owner/manager, Don McPherson, had the distinct pleasure of introducing Lisa Piccione, NBAA’s Senior Vice President of Government Affairs and Greg Pecoraro, AOPA’s Vice President of Airports and State Advocacy to the assembled conference attendees. The picture on this Blog is from that event. NANCY’S WILL BE CLOSED FOR THANKSGIVING from 11/25 through12/3 so that her wonderful staff can spend this special time with their families. ‘BOXBOROUGH-STOW EMERGENCY SERVICES APPRCIATION DAY’ is being planned for Saturday, December 14th from 10am to 2pm. During this period of thanksgiving, our pilot community, including Friends of Minuteman Airfield (FOMA), EAA Chapter 196 and the airport owner, has found a way to say “Thank you” to our local emergency personnel. Festivities will include a ‘cake cutting’ ceremony and free airplane rides. Mark your calendar now so you don’t miss out on this event. MAKE YOUR RESERVATIONS NOW FOR NANCY’S SOLSTICE DINNER on December 20th & 21st. This annual event is her way of celebrating the ‘return of the sun’ with great food and friends! Heated and ‘T’ Hangar Space available NOW – call OPS for details. Office Space Opening up in December – call OPS to join our ‘Merry Band’. GAS PRICES GOING DOWN SEPTEMBER 1ST! MINUTE MAN GOES ‘MULTI-MODAL’. On 8/14, yet another transient, this time from northwestern New Jersey, flew in and took advantage of our free shuttle service to the South Acton MBTA train station. He spent two days working in downtown Boston and returned by train Friday evening. The MBTA train schedule can be easily found on our website. If you are looking for help getting around on the ground once you touch down at Minute Man, call ahead to schedule the use of our always popular courtesy car. We are also happy to help you line up a taxi or rental car. FOMA’s ‘Hangar Talk’ is held on the first Saturday of each month. Join fellow aviation enthusiasts at breakfast and lively conversation starting at 8:30 am at Nancy’s. FOMA (Friends of Minuteman Airfield) has moved their web site to www.FOMA-6B6.com. Don’t miss any news-become a member today! FOMA’s ‘LAMA’ Contest, (‘Landed at All Massachusetts Airports’) rules and entry forms can be picked up in OPS and Magenta – don’t be left out. All successful contestants will receive a $50 gift certificate for dinner at Nancy’s. Explore each airport, make new friends, fill your ‘flying stories’ book chock full of new adventures! Get ready to have some fun and share it with a friend! We would love to publish the progress you are making, so stop by OPS and let us know how it’s going for you. EAA Chapter 196 is busy: (www.eaa196.org) On August 10th, they flew 38 children during their 4th Young Eagles event of the year. On Monday, 8/26 they will host their monthly BBQ at 6pm on Nancy’s terrace. All are welcome. ‘Wings and Wheels’ (www.WingsandWheelsMA.com ) has been WX’d out more times than I care to count, but not on August 15th. We had a beautiful evening, tons of classic cars and planes from as far away as North Adams, MA and Hartford, CT. Nancy’s wood-fired ‘Pie in the Sky’ is now a popular addition to each evening’s activities. ‘T2’ hangar tenants are finding that opening their doors is fun for visitors and rewarding for themselves as well. We are even expecting to see our hot air balloon friends on 8/22. This now popular community activity is being extended an additional week to September 5th to make up for all the rain earlier this summer. Come have fun on Thursday evenings. The 2nd annual ‘Airport Neighbor Ice Cream Social’ will be held every Thursday evening to coincide with Wings and Wheels through September 5th. We consider folks that live north of RT117 in Stow and south of RT111 in Boxborough to be our neighbors. You and your families are invited to drop by to chat with airport officials about the ins and outs, ups and downs, of airport operations and enjoy some free yummy ice cream. We hope to see you here. Our Full Moon Fly Out AUGUST 19th – 24th is great for introducing folks to GA. Consider inviting a fireman, policeman, selectman, reporter, state rep, or senator to go with you. Spread the word about the benefits of GA while having a good time. Call OPS for our destination. Wheels up at 5:30. *The ‘BEST FUEL PRICE’ may change during the month when our next shipment arrives. “BEST” FUEL PRICE THIS MONTH $5.39*! NANCY’S WILL BE CLOSED FOR VACATION 7/1 – 7/9. Visit www.nancysairfieldcafe.com for menus, hours, special events and more. Think of Nancy’s for your next family or business outing. OUR OPERATIONS OFFICE will be OPEN all month offering our low priced fuel and friendly service. Be sure to grab a complimentary bottle of ice-cold water on your way out! MINUTE MAN GOES ‘MULTI-MODAL’. Besides a taxi, car rental or friend to pick you up, folks are catching onto our free shuttle service to the South Acton MBTA train station. The train schedule can be easily found on our website. Call ahead to schedule the use or our always popular courtesy car. FOMA’s ‘Hangar Talk’ POSTPONED to August due to Nancy’s Café vacation schedule. FOMA has moved their web site to www.FOMA-6B6.com Make the switch today. Don’t miss any news!. FOMA’s ‘LAMA’ Contest, (‘Landed at All Massachusetts Airports’) rules and entry forms are being picked up daily in OPS and Magenta – don’t be left out. All successful contestants will receive a $50 gift certificate for dinner at Nancy’s. Explore each airport, make new friends, fill your ‘flying stories’ book chock full of new adventures! Get ready to have some fun and share it with a friend! EAA Chapter 196 is busy: On Saturday, 7/13 they will host their third Young Eagles event of the year from 9 am ‘til noon. On Monday, 7/29 they will host their monthly BBQ at 6 pm on Nancy’s terrace. All are welcome. ‘Wings and Wheels’ is off to a great start. We had 60 classic cars the first week and 75 the second with half dozen planes each time. Nancy’s wood-fired ‘Pie in the Sky’ is proving to be a popular addition to each evening’s activities. ‘T2’ hangar tenants are finding that opening their doors is fun for visitors and rewarding for them. This community outreach activity is proving to be a winner for everyone participating! Stop by any Thursday after 5pm. Airport Commissioners set August 18th for the 2nd annual ‘Airport Neighbor Ice Cream Social’. Neighbors are invited to drop by to chat with airport officials about the ins and outs – ups and downs of airport operations, while enjoying yummy Erikson’s Ice Cream. Watch for details next month. 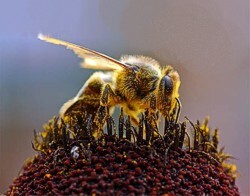 Our Farmers are busy: Our ‘Airfield Apiary’, with hives in Stow and Boxborough, has already harvested record amounts of early honey. Stanley Farms has bailed record amounts of high quality hay. Earnest Farms is now grazing goats in Boxborough and selling their Organic Eggs at Nancy’s. Cloudland Farm has started delivering seasoned firewood as well as supplying Nancy’s pizza oven. Our Full Moon Fly Out JULY 20th – 24th is great for introducing folks to GA. Consider inviting a fireman, policeman, selectman, reporter, state rep, or senator to go with you. Spread the word about the benefits of GA while having a good time. Call OPS for our destination. Wheels up at 5:30. Copyright © 2013 Minute Man Airfield, All rights reserved. SUMMER SOON !! Our spring bulbs have faded and our perennials are starting to bloom. Beach weather can’t be far behind ! ! ! See you on South Beach or Race Point, both ‘walk to’ beaches from Katama Airpark and Provincetown Airport, respectively. THANK YOU, Steve Rawding of MassDOT Aeronautics Division for explaining to us how the ‘Real World Design Challenge’ program works and how local pilots can help. Several pilots expressed interest in mentoring high school students in this exciting program. Check in OPS for more info. KATE HOGAN, thank you for your 5/2 update on legislation affecting General Aviation in our state. FOMA’s Hangar Talk on 6-1 was well attended again. FOMA has moved their web site to www.FOMA-6B6.com. Make the switch today so you don’t miss any hot news! General Aviation Day at the Statehouse on 5-13 was attended by Bob Glorioso, Co-Chairman of our Airport Commission, and Don McPherson, who helped promote GA with our state legislators. Dan Hnatio of Active Video (based at Minute Man with a lovely Taylorcraft) taped the event for the Massachusetts Airport Management Association (MAMA) for future promotional use. Thank you, Dan. On 6/8 they will host their second Young Eagles event of the year from 9am ‘til noon. On 6/24 they will host their second BBQ of the season at 6pm on Nancy’s terrace. All are welcome. Visit www.nancysairfieldcafe.com for details on this month’s schedule, specials and events. Remember Father’s Day requires reservations. The pizza oven made its first pizza at 5/31’s ‘dress rehearsal’ for Wings and Wheels. No big surprise, it was yummy! The ‘Wings and Wheels’ Planning Committee held their last meeting on 5/31. The 12 week event starts June 6th. Get details at www.WingsandWheelsma.com. Sign up at OPS to show your plane, lead tours, or provide ramp safety/security. This sure-to-be-fun community outreach activity will make everyone a winner! Get involved today. www.minutemanairfield.com Give us feedback on our new web site, which tells the 6B6 / GA story. Our Full Moon Fly Out JUN 19th – 26th is great for introducing folks to GA. Consider inviting a fireman, policeman, selectman, reporter, state rep, or senator to go. You can spread the word about the benefits of GA while having a good time. Call OPS for our destination. Wheels up at 5:30. *The ‘BEST FUEL PRICE’ is likely to change during the month when our next shipment starts flowing. “BEST” FUEL PRICE THIS MONTH $5.39! Spring at last!! We planted over 500 bulbs last fall for your viewing pleasure and they are now in full bloom outside the café – enjoy them NOW! 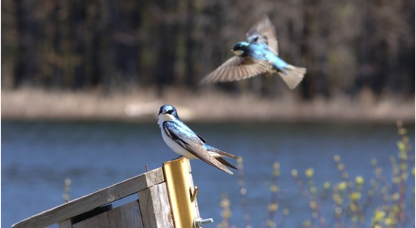 Watch for birds checking out your cowlings (and other openings) for nest sites this month! Trevor is now mowing grass. Be sure to pick up extension cords. TFR Party on 5-2 was a great success. MassDOT’s Steve Rawding gave an excellent presentation on the ‘Real World Design Challenge’ program how local pilots can help. Kate Hogan updated us on legislation affecting GA and reminded us all how important it is that the public show support for GA at the May 13 Aviation Day on the Hill at the Statehouse. Nancy’s provided refreshments. Stay tuned for the next TFR Party! FOMA’s Hangar Talk 5-4 @ 8:30am in the Café was a great success. We filled Nancy’s with FOMA members for a lively discussion. FOMA is moving their web site. You can now find them at www.FOMA-6B6.com. Make the switch today so you don’t miss any hot news! General Aviation Day at the Statehouse 5-13 from 11am to 2pm. Plan to join our Commissioners and FBOs there and help promote what you love, GA, with our state legislators. The Massachusetts Airport Management Association (MAMA) is organizing this event with the help of MDOT-Aeronautics. FOMA’s ‘LAMA’ Contest (‘Landed at All Massachusetts Airports’) rules and entry forms are being picked up daily in OPS and Magenta – don’t be left out. All successful contestants will receive a $50 gift certificate for dinner at Nancy’s. Explore each airport, make new friends, fill your ‘flying stories’ book chock full of new adventures! Get ready to have some fun and share it with a friend! On 5/11 they will host their second Young Eagles event of the year 9am ‘til noon. On 5/18 they will host their first ever 6B6 Fly-In here. Be sure to stop by and join the fun. On 5/27 they will host their first BBQ of the season at 6pm at a new accessible location – Nancy’s terrace. Check their web site www.EAA196.org for details. All are welcome. Visit Nancy’s on the Air Field for details on this month’s schedule, specials and events. Remember Mother’s Day requires reservations. The pizza oven is slowly taking shape. When it’s ready, Nancy will be baking off ‘tons’ of pizza. She is looking for brave folks to ‘taste’ it for free while she perfects her new craft! The ‘Wings and Wheels’ Committee is making great progress towards the 12 week event starting June 6th. Details are on the FOMA-6B6 website. Sign up at OPS to show your plane, lead tours, or provide safety/security. This sure-to-be fun community outreach activity will make everyone a winner! Get involved today. www.minutemanairfield.com has been refreshed, thanks to volunteer Commissioner, Jim Baum and Wendy Troupe. Please visit our new site, designed to tell the story of GA and 6B6. Feedback Please! Our Full Moon Fly Out May 22nd – 28th is great for introducing folks to GA. Consider inviting a fireman, policeman, selectman, reporter, state rep, or senator to go. You can spread the word about the benefits of GA while having a good time. Call OPS (978) 897-3933 for our destination. Wheels up at 5:30. Spring came early, then left us out in the snowy cold! Check out a ‘cool’ video of our snow blower in action on our FB page, then be sure to ‘Like’ us. On the bright side, our daffodils and tulips have re-emerged from the snow drifts; ‘Mud Season’ is behind us. RNWY 12/30 has firmed up and is now open for operations. Watch for birds checking out your cowlings (and other openings) for nest sites! FOMA’s ‘LAMA’ Contest, (‘Landed at All Massachusetts Airports’) rules and entry forms are ready for pick up in OPS. All successful contestants will receive a $50 gift certificate for dinner at Nancy’s. Explore each airport, maks new friends, fill your ‘flying stories’ book chock full of new adventures! Get ready to have some fun! www.EAA196.org will meet in the flight school classroom at 7pm on April 1st. All are welcome. Real World Design Challenge is a national effort associated with high school STEM educational programs. Marlborough High School students will be receiving their 1st place award Tuesday morning April 2nd at Jet Aviation at BED. MassDOT’s Steve Rawding will be visiting Minute Man later this month to explain how the program works and how local pilots can help. Watch for a date/time notice. NANCY’S at the AIR FIELD – WILL BE OPEN ON PATRIOT’S DAY for your dinning pleasure. Visit www.nancysairfieldcafe.com for details on this month’s schedule, specials and events. The Sherry & Whisky Tasting-Food Pairing event in March was well attended and enjoyed by all. Also, Nancy’s ‘wood fired, thin crust, pizza making oven’ has arrived from CA as a kit. We will assemble it post haste followed by a week-long curing process. When it’s ready, Nancy will be baking off ‘tons’ of pizza. She is looking for brave folks to ‘taste’ it while she perfects her new craft. Sign up now. Yum! The ‘Cruise In/Fly In’ (CI/FI) Committee is making great progress towards the 12 week event starting June 6th. Sign up at OPS to show your plane, lead tours, or provide safety/security. This sure-to-be fun community outreach activity will make everyone a winner! Get involved today. www.minutemanairfield.com will be refreshed ‘any day now’, thanks to volunteer Commissioner, Jim Baum and others. Watch for this new tool designed to tell the story of General Aviation and 6B6. 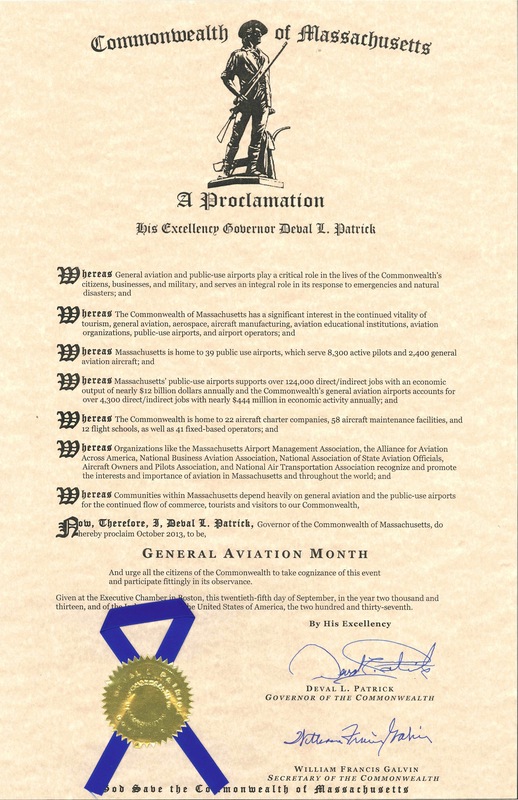 General Aviation Day at the Statehouse will be held on May 13th. Save the date, plan to join our Commissioners there and help promote what you love with our state legislators. The Massachusetts Airport Management Association (MAMA) is organizing this event. FLY IN & SKI at www.sundayriver.com. for as long as it lasts. A great day trip or spend the night. Our Full Moon Fly Out April 22th – 28th is great for introducing folks to GA. Consider inviting a fireman, policeman, selectman, reporter, state rep, or senator to go. You can spread the word about the benefits of GA while having a good time. Call OPS for our destination. Wheels up at 5:30. Boosting the ECONOMY, Serving the COMMUNITY, and Nurturing the ENVIRONMENT since 1969! OUR “BEST” FUEL PRICE THIS MONTH $5.49! ‘HANGAR TALK’ hosted by FOMA and repeating on the first Saturday of the month at Nancy’s, had a record turnout this month of over 20 supporters basking in the success of their ‘Winter Kickoff Party’. Nearly 100 guests at the party heard that the ‘State of the Airport’ is GOOD from owner/manager Don McPherson. MDOT Aeronautics Executive Director Chris Willenborg reported that 6B6 had ‘FLUNKED’ the just completed the statewide Pavement Condition Survey. We now have the third worst pavement in the state, which gives us a high priority for repair aid. Kate Hogan, our state Representative, pledged continued support for 6B6, extolling its virtues as an economic engine in the region. She also reported that she has filed legislation to help preserve privately owned – public use airports across the Commonwealth. Thank you Kate. Karin Gaffney and Laura Spear, Nashoba Rotary Club President and ‘Cruise In/Fly In’ Committee Chairman respectively, were introduced and explained about the club and next summer’s event. Dave Noble and Bob Bickford bestowed achievement awards to their customers that earned new ratings last year – it was a big group! Hector Constantzos and Andy Goldstein, EAA Chapter 196 leadership, announced Young Eagles Flight achievements. This included the chapter’s all-time leader, Nels Anderson with over 500 children flown! Way to go Nels (and the chapter support team). Thank you to our Stow (Jim Salvie & Tom Ryan) and Boxborough (Bob Stemple) Selectmen for showing their support – we hope you had a good time and made new friends. We welcomed newly based Aircraft Owners and Pilots and thanked our volunteer Commissioners for their dedication to fostering a healthy airport community. FOMA’s Greg Sheets introduced this year’s flying contest, ‘LAMA’. It is short for Landed at All Massachusetts Airports. All successful contestants will receive a $50 gift certificate for dinner at Nancy’s as well as filling their flying story book chock full with new adventures! Pick up contest rules and entry form in OPS and get ready to have some fun. Fun door prizes were given out and Don thanked his wife Nancy for providing the yummy food and for letting him play in his ‘sand box’ every day for all their 36 years together! FLY IN & SKI – Pilots have been asking us where to fly-in and ski most conveniently. Our good friend Fred Moses provided this useful input: “There are many wonderful New England ski resorts, but only Sunday River has the airport proximity and ground transportation that makes for an easy day trip. The Bethel airport is nicely equipped for transients, and there is a free shuttle within an easy walk. See bus schedule at: www.sundayriver.com/EventsActivities/WinterActivities/pdf/2012-2013%20MTNX%20Schedule.pdf ) Local cab service is another option. For more resort info, go to www.sundayriver.com. In my (his) C-182 the flight is just over an hour each way.” Thanks Fred! NEW ENGLAND WX – AN HISTORICAL PERSPECTIVE Stow is Don’s home and he cherishes living there, partly because of the friends he has made that respect local history. When he saw the Stow Historical Society’s latest news letter (attached), he thought to share it with his pilot friends. He is going and hopes to see you there. Make new friends in our ‘host’ community, enjoy a fascinating presentation, and have some fun at the same time!